Being green is about more than being eco-friendly; it’s about being a good citizen of the earth in ways that go far beyond the environment. When I think about being green, eco-friendly or earth-minded, I don’t just think about being kind to the environment. Sure, I think about conservation, preservation, and about embracing a lifestyle that embodies sustainable living; but I also think about simple things individuals can do to make the world a better place. 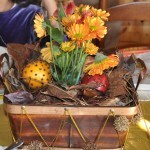 Gourds, pinecones, pine needles and colorful leaves, intentionally arranged can make festive centerpiece. And, with these fun freebies, finding them is half the fun. These aromatic, easy-to-make fire starters make wonderful hostess gifts. Buy fresh, local and seasonal food for your holiday feast. See what your local farmer’s markets and farm stands have to offer. Shop local, eat fresh by supporting local and nearby farmers. Make a commitment to a cause. Non-profit organizations typically see a surge in donations and volunteer participation in the month of November and through the holiday season. But, once the new year rolls around, much of that support fades. This year, select an organization to which you can make an ongoing commitment of either time, money, materials or some combination so that they can benefit from your support throughout the year. For volunteer opportunities, visit Volunteer Match. While many people increase their financial giving this time of year, giving can take many forms. Give away books, toys and clothes that are collecting dust in your home. Schedule a pickup by a non-profit through Good Donor. It’s as easy as completing an online form, checking the list of acceptable items from various organizations, selecting a date, then packing and waiting for the pickup. You can also donate to some items to homeless shelters or post them on Freecycle. Adopt a new sustainable practice. Get yourself removed from direct mailing lists to reduce your junk mail. Buy a push mower. Pitch paper napkins and paper towels. Set up a bird feeder for birds who overwinter here. Take a hike – literally! The colors this time of year are absolutely brilliant! The cool temps mean that you won’t easily overheat. Get out and connect with the natural world. Some of my favorite nearby hiking spots include Dyke Marsh Preserve, Theodore Roosevelt Island, Turkey Run, and Daingerfield Island. Shop Small Businesses on Nov. 24. American Express is encouraging shoppers to shop local small businesses on Nov. 24 as a way to support local communities and small business owners. Get details. Brag about it! What ever you do to contribute to the greater good, brag about it. This stuff is contageous. Everyone loves a great feel-good story. Your good deeds just might inspire another. So, don’t be shy. Talk it up! Have a fun, festive, and filling Thanksgiving!